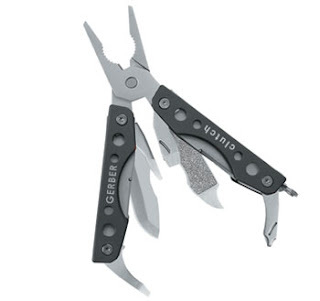 The clutch is a pliers-based multitool that has a size bteween a keychain tool and a full multitool, it is similar, slightly bigger than the leatherman squirt, bigger than a LM micra but smaller than the Leatherman Juice series. Available in red or greay it features slightly textured handles with cutouts. One of the handles labeled "nailfile" you can find a flat philips driver, a flat driver that also acts as a cap lifter and bottle opener and the nailfile with a pointy shape to be used as a nail cleaner too. The second handle is labeled "blade" and features a small blade, eyeglass screwdriver and non removable tweezers. All these tools can be used without opening the pliers, the labels help you know which side to use. The pliers have square shaped ends and are not spring activated, to our taste rounded pointy pliers are better. They work well an are strong and the handles offer a very good non slippery grip. The small tools behave as expected, the tweezers being short, wide and non removable are not very useful. The tool has a spliring attachment point in case you want to use it in your keychain or attach it to some clip or lanyard. The clutch feels compact and heavy for its size and the general impression is that the tool is a good quality product, being quite affordable in price it is a good option if you like the tool selection offered. You can order from REI for $18.